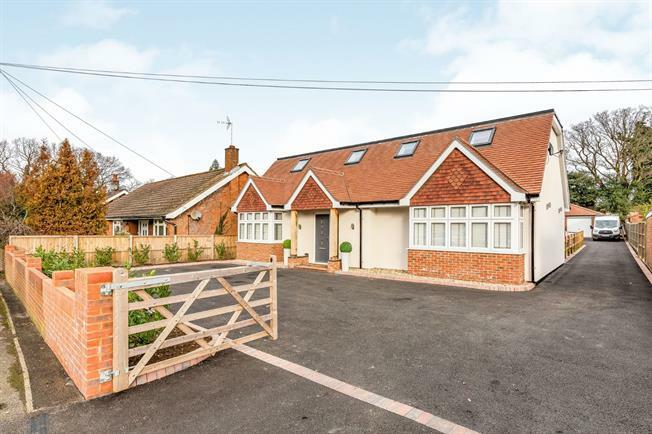 4 Bedroom Detached Bungalow For Sale in Camberley for Guide Price £750,000. On the ground floor there is a large separate living area and a downstairs bedroom. Moving through the spacious entrance hall towards the rear of the property is the superb kitchen / dining / living room, complete with bi- fold doors, sky lights, integrated modern appliances and separate utility and w/c The upstairs features three fantastic sized double bedrooms which are all serviced with generous en-suite bathrooms and boast plenty of integrated storage and wardrobe space. Externally there is parking for multiple vehicles and dual driveways. The garden features a delightful patio area and a low maintenance artificial lawn..